Peloton Goes To the Dogs. Literally. How Can Following That Closely Be Safe? People who see Peloton’s platooning technology in action on a highway typically ask the same question: How can it possibly be safe for two trucks to follow each other that closely? The answer lies in our direct vehicle-to-vehicle (V2V) communication, a proprietary implementation of the industry-standard dedicated short-range communication (DSRC) protocol. 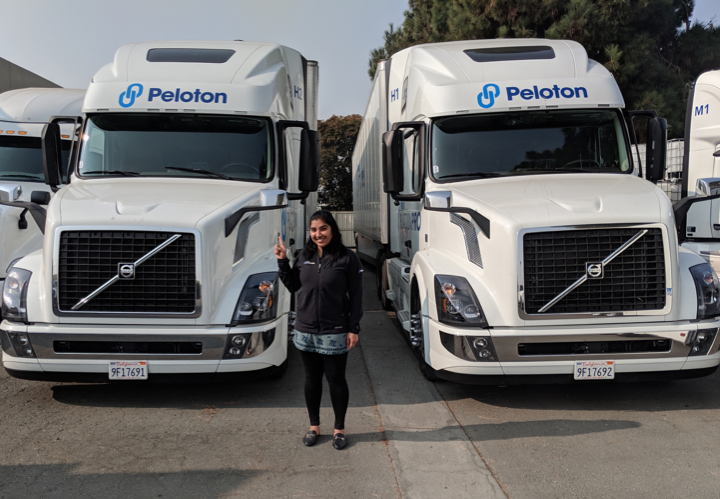 Peloton’s V2V communications connects two platooning trucks together electronically, allowing them to accelerate and brake together as a single system. For example, when the driver of the lead truck brakes, the following truck brakes nearly instantaneously—well before the driver would have had time to react to the brake lights. What’s the safe distance between two non-platooning trucks traveling 55 mph on a highway? According to the Federal Motor Carrier Safety Administration (FMCSA), the average stopping distance for a loaded tractor-trailer traveling at 55 mph in ideal conditions is 196 feet. That stopping distance can be even greater depending on road surfaces, debris, or adverse weather conditions such as rain, ice, or snow. At 55 mph, a truck is traveling at 81 feet/second. Driving safety guidelines typically urge drivers of large vehicles to follow a 4-second rule for following under perfect conditions, plus an additional 1 second for each adverse condition—or a minimum of 324 feet for driving on well-maintained straight, dry highways. Built into the 4-second rule is an allowance for driver reaction time. Even for the best drivers in the world, there’s a delay between seeing a brake light on a vehicle ahead and moving the foot from the accelerator to the brake pedal. The safe-following guidelines also consider differences between the braking capabilities of the two vehicles. But with Peloton’s V2V communications, two platooning trucks no longer behave as discrete vehicles. Because of their direct electronic connection, the platooning trucks brake and accelerate as a single unit—predictably and safely. When the front driver brakes, the follow truck will brake automatically to maintain a constant gap between the trucks. In fact, the follow truck can even brake more aggressively than the front truck. In addition to linking longitudinal control between two platooning trucks, V2V communications establishes a direct voice and video link between the drivers of the two platooning trucks. Peloton’s platooning is very much a team activity. The V2V communications enables the drivers of the platooning trucks to communicate easily, securely, and reliably with one another. For example, when traffic merges onto the highway as the platoon passes, driver communication can improve coordination to move the trucks to another lane to preclude cut-ins by other vehicles, or to increase the gap to allow the merging vehicle easier access. Drivers can work together to improve the platooning experience and efficiency. In addition, a video link lets the driver of the following truck see what lies ahead of the lead truck, via a camera mounted to the front of the lead truck. With greater visibility into upcoming road, traffic, or weather conditions, the driver of the following truck is able to feel more connected to the driving experience. DSRC has been around for many years and is a proven communications protocol. It occupies a government-allocated radio spectrum (in the 5.9 GHz band) for private short-range wireless communication, specifically designed for moving vehicles. DSRC is a mature technology that is beginning to be commercially deployed by auto makers, including in some of General Motors’ Cadillac sedans. Peloton has added a proprietary antenna system to the standard DSRC protocol to facilitate V2V communication between the platooning trucks. Peloton mounts multiple antennas in the rear-view mirrors of the trucks, to enhance data and video sharing. Unlike the prominent ‘whip antennas’ of CB radios, Peloton antennas are inconspicuous and don’t disrupt the appearance of the trucks. If you see two trucks on the highway separated by a consistent distance of about 40 feet, as long as they’re platooning using Peloton technology there’s no need to worry about how close together they are. Peloton’s advanced V2V communications, built on industry-standard DSRC protocols, actually makes those two platooning trucks more safe than many other trucks on the road.